Over 200 top finance professionals gathered at the MENA CFO Awards organised as part of the CFO Strategies Forum MENA by Naseba. 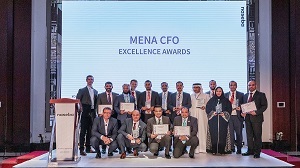 On the occasion, the Middle East and Africa region’s leading chief financial officers and their teams were honoured for their work in driving digital change in the CFO role. Celebrating excellence, the prestigious annual awards spanned six categories and recognised the most successful financial leaders across the public and private sectors. Yuvraj Narayan, Group CFO of DP World, was declared the winner of the coveted MENA CFO of the Year award while Nidal Al Khatib, Group CFO Al Hail Holding, won the trophy for the Revolutionary CFO of the Year. Change management and digital native CFOs is a key priority in organisations, espeically as CFOs are the ‘co-pilots' with the CEO for decision making.